US Amb. Haley slams Iranian aggression in Iraqi, promises that the US will hold Iran accountable for proxies' attacks on US targets. US Ambassador to the United Nations (UN) Nikki Haley on Thursday chaired a UN Security Council meeting on the Middle East. At the meeting, Haley pointed out the gravity of Iran's actions, and urged the Council to focus on Iran's aggression in Iraq. "The Palestinian-Israeli conflict is serious and worthy of this Council’s attention. But if there is one country that is the source of conflict and instability in the Middle East – one country that merits a quarterly debate in the Security Council – that country is not Israel. It’s Iran," Haley said. "For almost 40 years, the Iranian regime has existed outside the community of law-abiding nations. It is difficult to name a conflict in the Middle East that does not have Iran’s fingerprints on it." Emphasizing the danger the Iranian regime presents to the Middle East, she explained, "The Iranian regime has backed dictators who gas their own people. It stokes conflict. It funds foreign fighters and terrorists. It transfers missiles to militants. It acts against the interests and policies of this Security Council, time and time again." "Across the Middle East, Iran has trampled on the sovereignty of its neighbors. In Lebanon. In Syria. In Yemen. And the Iranian regime has shown a total disregard of the sovereignty of a country that is at a critical stage in its political development: Iraq. "Iran’s leaders pretend their interference in the sovereignty of other nations is done in the name of religious affiliation. They like to claim that they have been 'invited' into the affairs of other countries. In fact, the motives of the mullahs are much less elevated. They are interested in power. In the case of Iraq, their goal is to exploit uncertainty in order to create an Iranian-controlled corridor for weapons and fighters from Tehran to the Mediterranean. "In recent months, Iran’s aggression has escalated. Iranian proxies in Iraq operate openly, with funding, training, and weapons supplied by Tehran. The Iranian regime has reportedly begun over the last few months to transfer ballistic missiles to these proxies in Iraq. It is reportedly developing the capability for its proxy militias to produce their own missiles inside of Iraq." 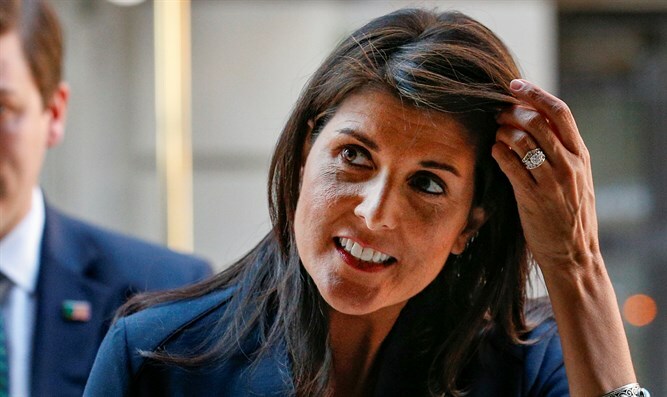 Slamming Iran for a "blatant violation of Iraqi sovereignty" and its recent firing of "a barrage of missiles from Iran into Iraq," Haley pointed out that "Iran attacked the headquarters of the Kurdistan Democratic Party of Iran, killing eleven people. This was not an act of Iranian proxies but of the Tehran regime itself. It was Iran’s first direct military strike into Iraqi territory in over a decade." "This Iranian interference in the sovereignty of Iraq should be of great interest to the Security Council for many reasons, not least of which is because it occurs in clear defiance of Security Council resolutions. "Iranian General and head of the IRGC Quds Force Soleimani is leading an effort to influence the composition of a new Iraqi government. "Soleimani was banned from traveling outside of Iran by the Security Council in 2007. That ban was reaffirmed in 2015 with the passage of Security Council Resolution 2231. Despite this unambiguous travel ban, Soleimani has practically taken up residence in Iraq since the May elections... He is not there to help create a government in Baghdad that is responsive to the Iraqi people. He is there to build an Iraqi government that is under the control of the Iranian regime. "Iran treats Iraq as if it was not an independent nation. Iran sees Iraq as merely a transit point for Iranian weapons and a training ground for Iranian proxies. Iran seeks to keep Iraq economically weak and dependent on its exports – even though Iraq has plenty of its own resources. Why? Because Iran wants to use a weak Iraq to illicitly fund its terrorist activities." Haley also warned that the US would not ignore the recent attacks on the American Embassy in Baghdad and the US Consulate in Basra. "Using proxy forces in Iraq does not give the Iranian regime plausible deniability when attacks like this occur," she warned. "The Trump Administration does not, and will not, buy that. Iran could have stopped its proxies’ attacks. It chose not to, so the White House responded by putting Tehran firmly on notice." "We hold the Iranian regime fully accountable for its proxies’ attacks on US facilities and personnel in Iraq. And we will not hesitate to vigorously defend American lives. "Every nation has the sovereign right to govern itself, protect its people, and defend its borders. No less than any nation, Iraq has that right. And yet, at a critical time in its history – as Iraqis build their government – Iran is acting in shameless disregard of Iraqi sovereignty. It is threatening populations to promote its own political leaders. It is undermining a key feature of sovereignty – a state monopoly on the use of force – by promoting its own militias. "The United States is committed to working with Iraq to help it create an inclusive and independent government. Iraq is working to recover from years of conflict against ISIS and still to overcome the legacy of Saddam Hussein’s tyranny. "Not only is Iranian interference preventing forward progress for the Iraqi people, it is pulling them backward to the conflict and division they are striving to put behind them. This is the very same conflict and division that Iran promotes in Syria, Yemen, Lebanon, and across the Middle East. "All members of the Security Council who respect the principle of national sovereignty should be concerned. And all who respect the right to self-determination for the Iraqi people should come to their defense."